Today I found out about William Burke and William Hare: two men who murdered 15 people (though sold 16 bodies overall) over the course of a year to make extra money, selling the bodies as cadavers for university students to dissect. These murders took place starting in November of 1827 to October of 1828. At the time, it was very difficult for universities to get human bodies for students to dissect. The only ones that could legally be acquired by universities were those from executed convicts. This had once been an adequate supply, but thanks to certain legal changes that resulted in a drastic reduction of executions and thanks to the fact that the study of anatomy had become more popular as medical science progressed, there began to exist a huge shortage of human bodies. William Burke and William Hare took this practice a step further. Rather than wait for people to die, they began a year long killing spree, providing a steady stream of bodies for Dr. Robert Knox who was a private lecturer, teaching anatomy classes to University students. The murder spree started relatively innocently enough. At the lodging house that Hare operated they had an elderly gentlemen named Donald who owed Hare £4 in rent when the old man died. Knowing that one could sell a body to universities, they decided to fill the coffin with bark and steal the body to sell to make up for the loss of the rent money the dead man owed. They originally intended to sell the body to Professor Alexander Munro of Edinburgh Medical College, but after making inquiries were re-directed to Dr. Robert Knox, a private lecturer, whose assistant instructed them to bring the body after nightfall. When they arrived with the body, it was inspected by Dr. Knox’s assistants and Burke and Hare were offered £7.10s, which would be around £730 today, or around $1100. Hare soon had another sick tenant on his hands, Joseph the Miller. While Joseph wasn’t necessarily sick enough to die, the two decided they thought that he was going to eventually die. Because he was in pain, they reportedly rationalized that if he was going to die anyways, they ought to put him out of his misery sooner, rather than later, and sell his body after the deed was done. They did so by first getting him really drunk to the point that he passed out. Next, one of them pinched his nose and held his mouth shut, while the other laid on his body and held Joseph’s arms and legs down, in case he should struggle. By doing it this way, they left no mark of violence on the body, which might arouse suspicion. It also made it appear the person had died either of illness or over-intoxication. The two decided to repeat this process whenever sick tenants popped up. However, they soon found that Hare’s tenants remained annoying healthy. Being short on any other sick or dying tenants, the Burke and Hare decided to simply lure people in from the streets, initially people who wouldn’t be terribly missed; specifically targeting old people who they could easily overpower and would be more likely to be thought to have died of natural causes. Abigail Simpson: In February, the two invited this elderly woman to spend the night at Hare’s lodging house, rather than return home directly. She was in Edinburgh temporarily to collect her pension money. They subsequently got her drunk, but made the mistake of getting too drunk themselves, at which point they passed out and slept the night through. The next morning, Simpson awoke and was preparing to leave, but was first offered some whiskey to cure her hangover. They soon got her very drunk again and she passed out and was subsequently smothered in the same fashion as Joseph the Miller was. This time Dr. Knox inspected the body personally and was pleased to find it extremely fresh, paying £10 for it. An Englishmen: This man was a match salesman who became ill while lodging at Hare’s. Burke and Hare subsequently “put him out of his misery” and sold his body. An old woman: This woman was lured in by Hare’s wife, Margaret, who later claimed to be ignorant of her husband’s deeds. Nonetheless, on this occasion, she lured the woman in, got her very drunk, and then sent for Burke and her husband, leaving them alone with the passed out woman. It would appear from this that she was fully aware of what Burke and Hare were doing. Mary Patterson: on April 9, 1828, eighteen year old Patterson and her friend Janet Brown, who were prostitutes and fairly well known around town, were invited to breakfast at Burke’s brother’s house. Soon Patterson passed out, but Brown held her liquor better. Burke then invited Brown to a tavern to get her further drunk. She still didn’t get drunk enough to pass out, so he once again invited her back to his brother’s house intending to get her more drunk. Helen McDougal, Burke’s mistress, showed up and was upset at Burke having prostitutes in the house and an argument ensued. He eventually got rid of Helen, but she remained outside screaming at the house, so Brown decided to leave, despite Burke trying to get her to stay. This argument ultimately saved her life. Patterson was not so lucky and was murdered and sold to Dr. Knox. Brown decided to return after becoming concerned for Patterson and asked after her. Brown was told she had left with Burke and would be returning soon, so Brown decided to wait, which nearly cost her life. However, her landlady became concerned about her after learning of the missing Patterson and that Brown was alone waiting and so sent her servant to fetch Brown from the house. Despite the fact that many of the students recognized Patterson, having previously hired her services, her body being sold and dissected was kept quiet and Brown was not told by anyone what had happened to Patterson, despite her frequently inquiring around town. Effie: This woman was an acquaintance of Burke’s and a beggar who he occasionally bought leather from when he worked as a cobbler. When she offered to sell some leather scraps to Burke, he invited her to drink at the lodging house’ stable. She was murdered after their standard modus operandi and sold for £10. A drunk woman: This woman was in the process of being arrested and taken to jail until she sobered up when Burke claimed to the police that he knew her and would take her home. The two subsequently murdered her in their normal fashion and sold her body for £10. An old woman and her deaf grandson: In June of 1828, Burke had been attempting to lure an old man home, promising him free whiskey, but while walking home with the man, an old woman with her deaf grandson asked Burke for directions. Burke then told them he’d take them where they needed to go and left the old man, who was none too pleased at the loss of the promised free whiskey. Rather than take her directly where she wanted to go, he invited her to stop for a rest at his home. The grandmother was made drunk after their normal fashion and smothered while the boy was entertained in another room by Helen and Margaret. Once she was dead, they argued on whether they should simply let the boy go, as they didn’t think he’d drink whiskey and they didn’t want to make it obvious the boy had been murdered. In the end, though, because they were afraid the boy might return with authorities looking for his grandmother, they decided to kill him. Rather than get him drunk and smother him, they instead broke his back. The two bodies together sold for £16. Mrs. Ostler: She came to the lodging house and stayed briefly before being murdered and sold. Ann McDougal: She was a relative of Helen McDougal’s, Burke’s mistress. While in Edinburgh, she decided to stay at the lodging house, to her doom. Burke supposedly didn’t take part in this murder, asking Hare to do the smothering, as Ann was a friend. Her body went for £10. Mary Haldane: Like Mary Patterson, she was a prostitute, albeit an old one. Hare invited her back to his lodging house and got her drunk and he and Burk smothered her in the stable. Peggy Haldane: She was Mary’s daughter and, unfortunately, she learned that her mother had gone to Hare’s lodging house, so went their looking for her. Initially the two denied the Mary had been there, saying they didn’t take in prostitutes. Eventually, they admitted she stopped by and invited Peggy in for a drink and subsequently got her drunk and murdered her as they had just done to her mother. James Wilson: Wilson was an 18 year old mentally retarded person who also was somewhat crippled with a bad foot. He was fairly well known around town due to the fact that he often lodged with various people (whoever would take him in). He was also known for his kind-hearted disposition and for entertaining children on the streets. In October of 1828, Hare decided to target Wilson. Hare approached Wilson, who asked him if Hare had seen his mother. Hare replied he knew where she was and Wilson should follow him. Soon Burke joined them, but they couldn’t manage to get “Jamie” to drink much. Despite this, they attempted to kill him anyways, but Jamie almost proved a match for the two. In the struggle, he managed to throw them off him and pin Burke down, but was eventually smothered. They were given £10 for the body. After he was murdered, his mother began inquiring after him. When Jamie’s body was recognized by students of Dr. Knox, Knox quickly began dissecting the cadavers’ face as well as cut off the head and feet in order that no one could positively identify the body (one of Wilson’s feet was deformed and easily recognized). Mary Docherty (some say Mary Campbell): She was lured into the lodging house by Burke. Docherty was an Irish woman and had a thick accent, as did Burke. When he learned her name, he told her his mother was a Docherty and they were probably relatives. She was not murdered directly, due to the fact that there were other lodgers present at his home, James and Ann Gray (Burke and Helen no longer lived with Hare, for more on that, see the Bonus Factoids below). He then convinced the Gray’s to leave and stay at the Hare’s lodging house. However, Ann Gray returned the next day to retrieve her stockings she had left near a bed (some accounts say potatoes that were stored near the bed, which seems odd). Initially she was not allowed to retrieve them, but later they managed to get into the room and found Docherty’s body under the bed and subsequently alerted the police, though not before being offered £10 a week by Helen to keep quite. Burke and Hare did manage to remove the body before the police arrived, but not without witnesses observing them carrying a large tea chest from the house. The porter of Dr. Knox also later confirmed that the body in question was brought in a tea-chest. In any event, initially this was not known and the police had little direct evidence. However, when interrogated, Burk and Helen’s stories as to when Docherty left didn’t match (one said 7am, one said 7pm), so they were arrested. The police soon discovered Docherty’s body in Dr. Knox’s classroom. When the story of this last murder became well known publicly, others came forward and began to connect disappearances with people coming in contact with Burke and Hare shortly before their disappearance. However, because there was very little direct evidence that the two had actually murdered anyone (no actual witnesses), the case against them surprisingly wasn’t a good one. It was also unclear at the time whether Helen and Margaret had actually been involved directly or even knew what had been going on. With the lack of direct evidence, the Lord Advocate decided that Burke had been the leader and so offered Hare full immunity if he would just confess and give evidence against Burke. Hare accepted the deal and also implicated Helen. Burke soon cleared her, claiming she knew nothing of the murders (though this is obviously very likely false). While it was still thought that Helen had been involved, because it could not be directly proven, the jury was forced to let her off, but convicted Burke. When the verdict was read, Burke was reportedly overjoyed that Helen was free. Burke was subsequently executed via hanging just over a month later on January 28, 1829. Seats with a view of the gallows apparently went for an extremely high price over normal executions. When he witnessed the angry crowd constantly screaming at him, Burke reportedly rushed to the noose in an attempt to speed up the process. He did not die immediately upon being dropped, but kicked about for around one to two minutes before finally going still. He was then left to hang for around a half hour. After he was taken down, many in the crowd attempted to grab pieces of the rope, shavings of the coffin he was placed in, etc. as souvenirs of the event. In the interim between his conviction and hanging, Burke wrote a detailed account of the murders, including Hare’s part in them. After being hung, his body was sent to be dissected at Edinburgh Medical College. This dissection was done publicly, led by Professor Alexander Monro. In the end, Burke was the only one punished for the crimes with Hare and his wife, Margaret, and Helen McDougal getting off more or less scot-free. Burke also swore that Dr. Knox had not known anything about where the bodies were coming from, so he too was not convicted of any crime. Although, evidence suggests he encouraged Burke and Hare to keep bringing him bodies as quick as they could acquire them. All total, it is estimated that Burke and Hare took in approximately £160 (close to £17,000 today or around $26,000) over the course of the year for their victims’ bodies. Being raised religious, Burke was asked how he came to commit such terrible acts of evil. Burke blamed his fall on his addiction to drinking, which ultimately lead to a life lived in adultery, as well as resulted in him becoming acquaintances with all manner of evil people. He stated that it soon hardened him and he became indifferent to many things he formerly would have thought horrifying, such as murder. Helen McDougal at one point became a potential target, despite being the mistress of Burke. However, supposedly Burke refused to let her be murdered. Probably due to concern over Helen’s safety after this, Burke and Helen moved out of Hare’s lodging house directly after this was suggested. Although the Burke and Hare continued their scheme, despite no longer living together. However, in an attempt to appear more the victim, McDougal also claimed that Burke and Hare had decided that should they ever be short on money, they’d simply murder both women, with McDougal to be the first. Given that neither woman showed any signs of wanting to leave their men until after they were arrested, it seems unlikely that this latter story is actually true. The method Burke and Hare typically used to kill their victims, namely smothering or strangling a person, eventually became known by the slang term “burking”. 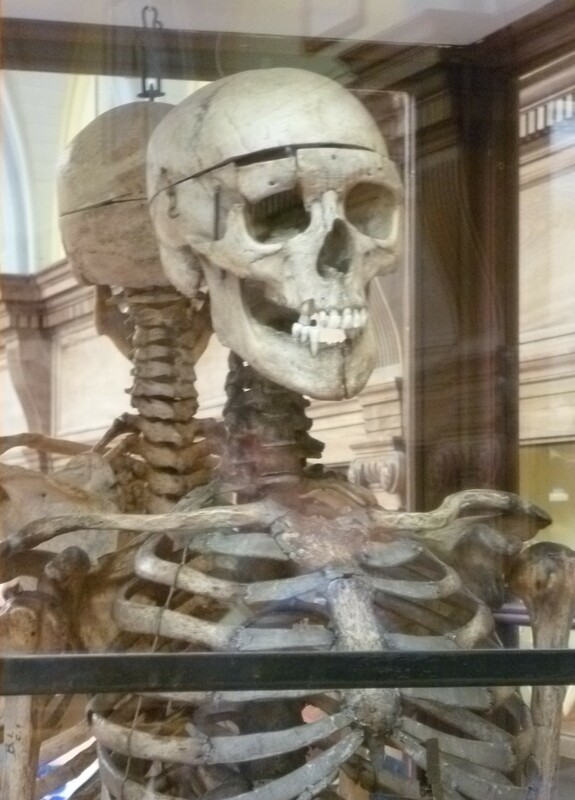 Burke’s skeleton and tanned skin are currently on display at Edinburgh Medical College in their museum. The Police Information Center in Edinburgh also has a card case made out of Burke’s skin. Burke was originally from Ireland where he apparently lived a pretty normal, non-criminal life, working in the military as a servant to an officer. He also had a wife and two children. Unhappy with his situation, he decided to move to Scotland, but his wife refused to follow, so he left her and the kids and moved to Scotland where he took a variety of jobs, such as a general laborer, a weaver, a baker, and a cobbler. Hare also was born in Ireland and immigrated to Scotland, working as a Union Canal laborer. The two met when Burke moved to the West Port region of Edinburgh, into Tanner’s Close, where Hare owned a lodging house that Burke lived in for a time. Helen McDougal, when she was released, was attacked by a mob and was only saved from being killed by the police. She then fled to England, but was again attacked by a mob and saved by the police. What happened to her next isn’t known, but it is thought that she moved to Australia. Margaret Hare also met a mob upon her release, encountering a mob both in Glasgow and Greenoch, before fleeing to Ireland. It is not known what happened to her next. Hare himself was released from prison in February of 1829 after being cleared thanks to his aid in convicting Burke. He was initially to be set free immediately, as per the deal he had struck. However, it was discovered that an old law allowed that a person might be detained until they could pay the cost of their prosecution, so he was kept for two months until he could do so. Little is known of what happened to him after, though it’s thought he did not rejoin his wife in Ireland. He disappeared shortly after being trapped in The King’s Arms Inn with a mob having chased him into the building, attempting to stone him. He was allowed to stay at the Inn until well into the night when the crowd dispersed. Once they were gone, he fled and was not heard from again. In the aftermath of these murders, the Anatomy Act of 1832 was passed, which greatly expanded the supply of cadavers through legal means, which subsequently killed the black-market for cadavers. Specifically, this act allowed doctors, medical teachers, and medical students the right to legally dissect donated bodies, not just executed felons. The Act stood until 1984 when it was repealed with the Anatomy Act of 1984 replacing it, followed by the Human Tissue Act of 2004. Dr. Knox also was not immune to the mob’s wrath. He continued to teach, but had the problem of frequently having his lectures interrupted by crowds yelling that he should have been strung up with Burke. His home was also frequently vandalized. Eventually, students stopped wanting to take his classes and he lost his primary source of income. He then tried to get an official position at the University, but failed. He was also soon forced to resign his position as curator at a museum he himself had founded. After the Anatomy Act passed, many more bodies were made available and he also lost that advantage (he had continued to buy bodies in the interim, making his classes one of the few a student could attend and actually get to work on a real body). After a time, he moved to London, working at a Cancer Hospital and publishing various works. A common misconception was the Burke and Hare were also grave robbers, but Burke denied that they’d ever done this in his official confession: “No, neither Hare nor myself ever got a body from a churchyard. All we sold were murdered, save the first one… We began with that: our crimes then commenced. The victims we selected were generally elderly persons. They could be more easily disposed of than persons in the vigour of youth.” Given that he was already going to be executed and seemed to have no qualms confessing to all the murders (even ones to which he was not tried for), it seems likely enough he was telling the truth on this point. Incredibly informative article! Thanks for keeping them coming! @Joshua Bowman: Whoopsadoodle. 😉 Fixed! Two typos in the paragraph about Mary Patterson: “She till didn’t get drunk enough ” should be “She still didn’t get drunk enough “. Also, “This argument ultimately saver her life” should be “This argument ultimately saved her life”.